ST 37 - "Metropolis" / ST 37 - " Destiny"
Have you ever seen a rock band perform the soundtrack live to an old silent film? It's pretty cool. A few years ago I saw a local avant-jazz band perform the music to The Lost World at a sci fi convention. Texan space rock, punk, experimental legends ST 37 have taken a whack at two Fritz Lang films with some impressive results. I can't imagine anyone with even a passing interest in movies not being familiar with the 1926 film Metropolis. It's a classic that is still stunning to watch even in these days of over the top computer generated special effects. This performance of Metropolis was recorded on 8/27/98 at the Alamo Drafthouse Cinema in Austin with Scott Telles on bass, Carlton Crutcher on electronics, Joel Crutcher on guitars, Mark Stone on guitars and Dave Cameron on drums. A fair portion of the performance was released as part of ST 37's The Insect Hospital album released last year on Black Widow Records. But for those of us who were keen to hear the soundtrack in its entirety, the bands own Blue Circle label has released this 100+ minute 2-CDR set. Though the heart of Metropolis is socio-political commentary, the context is a futuristic world with a science fiction basis. And who better to create the music to a sci fi silent film than a space rock band. Even without the film in mind this would be a good ST 37 set. But because they're following the film the music is continually on the move, constantly transitioning to interpret the voiceless action on the screen, which they do admirably. My favorite parts are when the music is drifting along in a state of spaced out calm and then launches into intense rocking jams. CD2 has some especially monstrous stoner-space jams. But there are also lots of atmospheric segments that can be alternately floating, noisy and darkly intense. If you try to picture the film in your mind, or even try to synch the music up with your own video or DVD copy of the film, then you'll get a feel for the challenges, and resulting successes and warts, that accompany trying to construct a silent film score that follows a linear, story telling path. There is NO sound… the band is the voice of the film. It must have been great fun seeing this live. 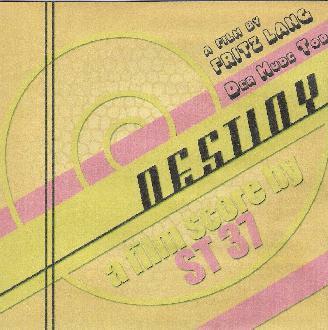 And the citizens of Austin must have agreed because in 2002 ST 37 performed the music to a lesser known Fritz Lang film, titled Destiny (released in 1921). By this time long time member Carlton Crutcher had left the band, replaced by Brian Wotring. The music was recorded during a 4/27/02 performance of the score, again at the Alamo Drafthouse, and comes as a 97 minute 2-CDR set. 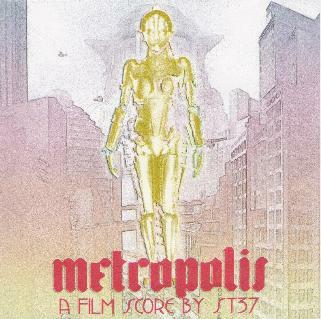 Unlike Metropolis, which I've seen numerous times, and for which I could easily conjure up imagery while listening to the music, I'd never even heard of Destiny prior to receiving the ST 37 soundtrack. So instead I accompanied the listening experience with reading about the film from various sources I found through the lightning quick magic of Google. One thing that struck me throughout the set is that electronics are less prominent, which may be attributable to Carlton Crutcher's departure. But the multiple guitar patterns and textures are outstanding, occupying a fascinating experimental/soundscape/space/noise/industrial realm, while simultaneously incorporating melody to powerful affect. Overall I'd say ST 37's ability to tell a story and create imagery with music and sound has radically improved since Metropolis. Metropolis was in many ways classic spaced out ST 37 and will surely appeal to long time fans. But much of Destiny transcends space rock or any other genre tags we might want to slap on them. There's plenty of dark and intense space rock here to be sure. But the band do a bang up job of creating mood, atmosphere and cosmic tension. As for the rocking parts, like the Metropolis soundtrack, CD2 has some of the best spaced out jams of the set. Really awesome, high energy space rock. In the end, not having seen the film made no difference to the experience of putting on the headphones and climbing aboard the ST 37 ship. I'd love to see the folks at Kino do a DVD release of both these films with ST 37's soundtracks as that company is known for commissioning a variety of experimental composers to do modern music for classic silent films. In the meantime, get in touch with Scott Telles at scotttelles@yahoo.com about getting the music, and while you're at it ask him for a Blue Circle catalog. It's got LOTS of ST 37 gems and side project bands. For more information you can visit the ST 37 web site at: http://www.st37.com.